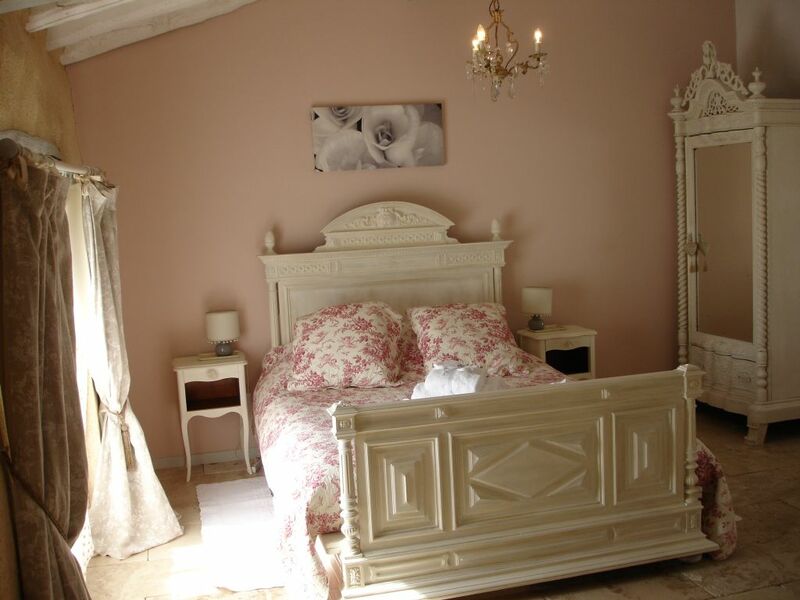 Mansion House is a very special find indeed - a glamorous blend of French country chic interiors with the best elements of self catering i.e. 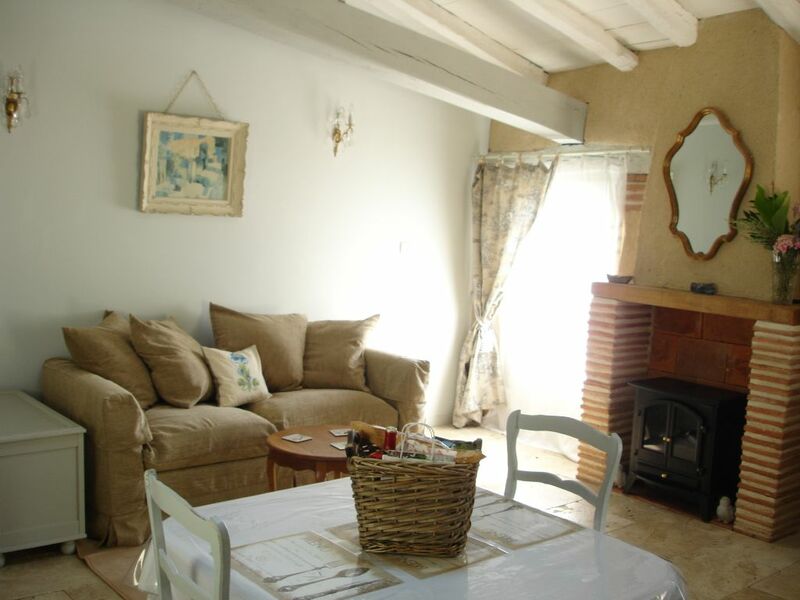 spacious, private accommodation and freedom to cook for yourselves, and the style, luxury and optional additional services of a boutique hotel such as bathrobes, slippers, champagne, flowers etc. 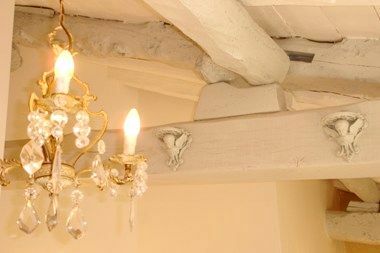 Lovingly restored by its owners, designers Juliet and Deane, and their team of local artisans, this grand 18th century former barn is now home to three luxury self catering suites with one, two and three bedrooms, fully equipped modern kitchens and their own private outdoor terraces. Each suite is stylishly decorated with an eclectic mix of modern, antique and traditional style furniture, attractive soft furnishings, antique mirrors and crystal chandeliers, and painted in cool restful colours. A fourth suite in the luxuriously converted former pigeonnier tower offers couples with a baby or small child a little extra romance as well as all the same standards and facilities of the barn suites. 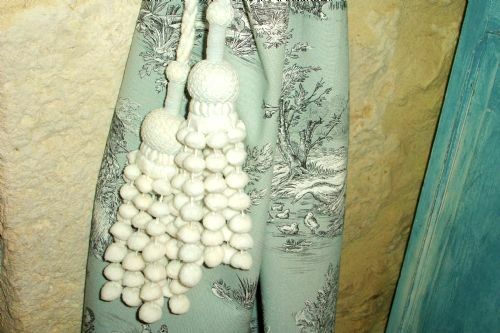 Despite their 18th century character, each has plentiful supplies of contemporary fixtures and fittings too. Their fully equipped kitchens come with free standing cooker, microwave, fridge/freezer, dishwasher, washing machine, kettle, toaster and coffee machine, plus a full complement of crockery, cutlery, and glassware, cooking utensils, iron and ironing board; whilst their living areas boast UK satellite TV and Video or DVD player, selection of films and a CD player. 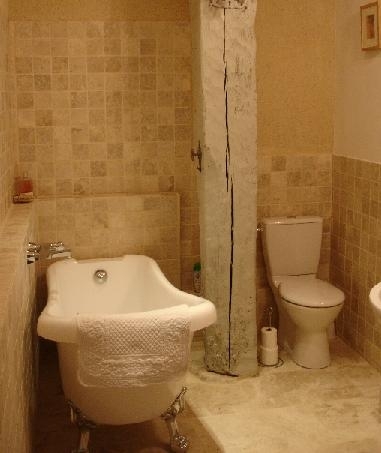 There's even a hairdryer supplied for each suite, completing the boutique hotel suite feel. Younger guests are well looked after too with a comprehensive list of nursery gear from sippy cups and sterilisers to cots and baby baths plus baskets of toys, books and colouring materials. The icing on the cake is the wonderful setting on an 8-acre country house estate complete with parkland, fields and orchards, plus a glistening 12 × 6 m pool with truly fabulous views over the surrounding countryside and villages. Here guests relax easily and time goes slowly. Days start taking in the views over al fresco breakfasts on the suite terraces or cooked for you and served on the lovely communal terrace. Later on it’s a tough choice between lounging by the pool soaking in the views or packing a picnic (self-made or ordered from the owners) and pottering around the grounds, perhaps a stroll into the pretty village for supplies or lunch? 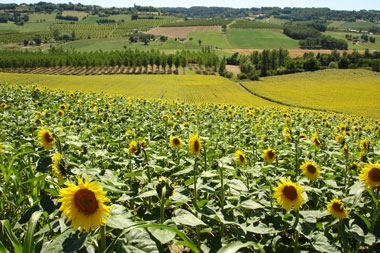 Or a daytrip to one of the pretty nearby towns or a St Emillion Vineyard? Evenings are generally spent sitting on the terrace enjoying the lavender scented breeze whilst enjoying a cool glass of local wine. Such an idyllic setting is sure to refresh even the most frazzled of parents! The Coco Suite is a romantic suite ideal for a couple and a baby with its spacious double bedroom, white wrought iron bed, and gorgeous bathroom complete with indulgent roll-top bath and L'Occitane toiletries. The open-plan living space is light and airy thanks to the large French doors, natural limestone flooring, exposed vanilla stone walls, white-washed beams and subtle lighting. 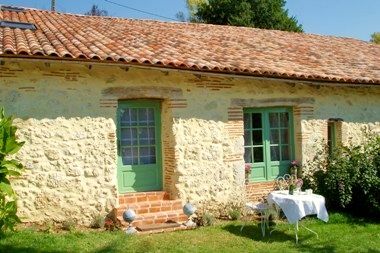 Guests can enjoy views across the gardens and onwards to the enchanting ‘pigeonnier' from the comfy three seater sofa, set beside a traditional ‘Toulouse stone' feature fireplace. To one side sits the fully equipped traditional galley kitchen and dining area, with French antique table and chairs. The French doors open onto an extensive covered veranda (shared with Lartigue suite), with teak garden dining furniture, perfect for enjoying outdoor dining or leisurely hours in the shade. In addition, there's a dedicated sunny seating area perfect for sitting with an evening aperitif and watching a spectacular sunset.. The 13th century bastide town of Sainte Livrade-sur-Lot is less than 5 minutes drive away and offers excellent bakeries, two supermarkets, newsagent, pharmacy, estate agents, hairdressers, doctor, banks, post office, tourist office, coffee shops and restaurants, including a particularly fine one overlooking the river. On Friday mornings the open-air market provides a colourful experience of French life, with local regional produce and delicious treats. The nearby historic town of Villeneuve-sur-Lot is a short 15 minute drive away, and boasts the most restaurants and pavement cafes in the whole region. There are also fashion boutiques, jewellers, antique shops, estate agents, some larger supermarkets and main post office. Market days are Tuesday and Saturday mornings, held in the open air at the main central square, spilling out into the neighbouring streets, and inside at the old covered market hall. Well worth a visit. 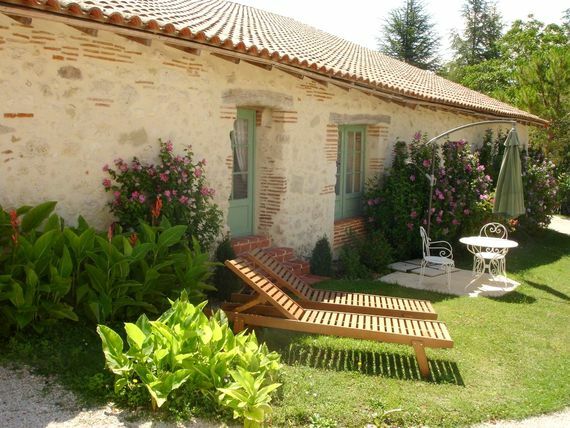 Agen is the capital of the region and can be found 30 minutes away by car nestled on the banks of the river Garonne. From here you can catch flights to Paris and rail links to Paris, Toulouse and Bordeaux, or spend time sightseeing and shopping in the bustling high street with its varied selection of cafes, restaurants and boutiques, which even includes one small department store. Nearest Medical Services: Doctors surgery 3 minute drive into the village with English speaking doctors, 15 minute drive to nearest hospital. Getting There: Nearest airports are Bergerac(approx. 45 mins), Bordeaux and Toulouse (both approx 1hr 45mins) . The closest ferry ports are Bilbao (4.5 hrs), St Malo (6hrs) & Calais(10hrs). Try www.skyscanner.net as a useful resource for finding flights, www.ferrysavers.co.uk for ferries and www.auto-europe.co.uk for car rental. Alternatively, the owners can provide a chauffeur. Nearest airports are Bergerac(approx. 45 mins), Bordeaux and Toulouse (both approx 1hr 45mins) . 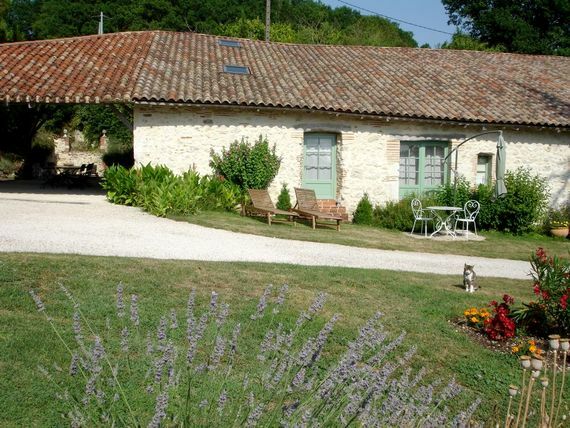 The local 13th century bastide town of Sainte Livrade-sur-Lot is less than 5 minutes drive away with bakeries, supermarkets, pharmacies, a doctor, banks, post office, a tourist office, coffee shops and restaurants. Little ones are welcome to use the lovely 12m by 6m heated, pool which has electric powered secure cover for maximum security and is closed when leaving the pool area unattended. Useful toys provided includes: toddler books, bath toys, DVDs, soft toys, general toys, sandpit & drawing materials. The suite each have dvd players and there is a library of dvd's and satelite uk tv. pre arrival shopping service is offered and can include baby essentials as well as groceries. A generous welcome hamper comes with all bookings. There's a shared play park with swings, slide + sand pit plus boules, hoola hoops, balls, pool toys, floatation aids, a paddling pool and ride ons for outdoor play. 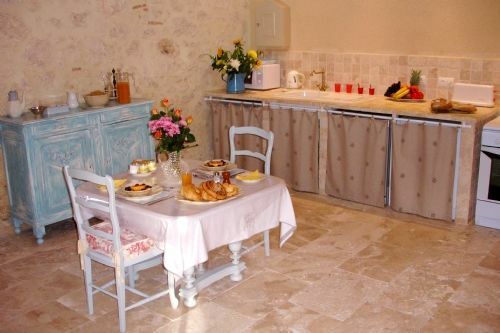 Bed and breakfast available for 10 Euros pp, 3 course home cooked meals are available with 24 hour notice as well as a private chef for dinner parties or romantic celebration meals (needs min. 48hrs notice). There is a private seating area outside. A little slice of heaven in the French countryside, far more luxurious than the photos and just a bit like the kind of place you would have gone before having kids - but kid friendly. Perfect! La Maison De Maitre exceeded every single expectation that we had. The accommodation was stunning and the location is just beautiful. The amount of equipment available for babies/toddlers is probably more than we even have at home! We can't wait to return, Juliet and Dean are fantastic hosts and their passion is clear to see. Very glad we found La Maison! Literally in awe of what Juliet and Her husband Deane have created here, from restoring their own house and creating luxury gites and mainly by their own hand, simply stunning. We travelled with our one year old son, and everything was thought of ..and more. The pool area was beautiful overlooking sunflower fields and even though it was shared by the 2 other gites we had it a lot to ourselves. 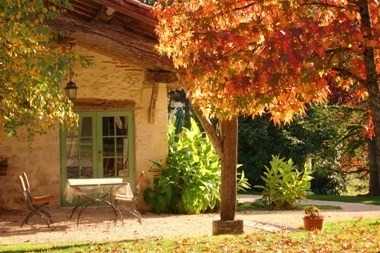 The gite itself was beautifully decorated and furniture was personally sourced and restored. We really felt like there was a lot of passion that had gone into this place with lots of personal touches. Juliet had the right level of hosting and was also an amazing chef with meals (if we wanted) while the baby slept. We realised holidays with children can also be very enjoyable for the mums and dads, if you choose the right place! 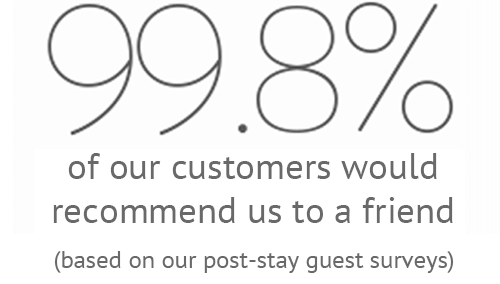 All in all, we would highly recommend, without a doubt! 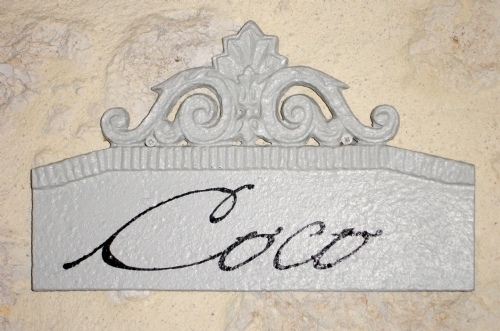 We had such a wonderful stay at the Maison de Maitre, Coco suite. The whole place is done so thoughtfully, we really only had to bring ourselves and clothes! Everything else was there! Would thoroughly recommend to anyone, with children or without. Thank you Juliet and Deane! 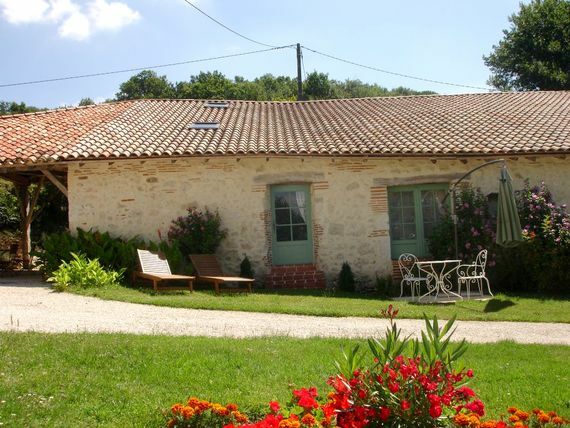 La Maison de Maitre is the perfect holiday destination for those with a small child who want a relaxing holiday. We had a really wonderful time. We had a fantastic stay, the accommodation was a very high standard set in lovely grounds with a fantastic pool. There was everything you could think of for a baby, made it a very easy and enjoyable holiday. 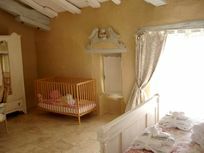 Myself, my husband and our 11 month old baby stayed at La Maison. We had a lovely week despite the weather being terrible! The location of the gite is stunning, the facilities are great - we couldn't want for more, everything is of a very high quality and taste. We stayed in the Coco suite which was lovely. Decorated to a very high standard, clean, spacious and very well equipped. We also sampled Juliet's 3 course meal on our first night which was delicious. I would highly recommend La Maison - enjoy! We could not rate this accommodation highly enough, Juliet and Deane have thought of everything and we cannot wait to go back. The location is beautiful and the facilities are outstanding, our daughter loved playing with all of the toys, and splashing around in the heated pool. Fantastic place. Could not recommend it highly enough and what Juliet and Deane have achieved is simply great. A fabulous location for pure escapism. Well thought out down to every little detail. Would highly recommend! Beautiful property, great location, our little girl loved it. Highly recommend a visit. 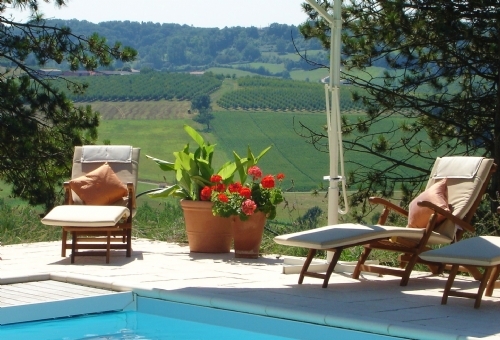 We had simply the best break in Juliet's stunning maison de maitre! We thought we wouldn't be able to have such a luxurious holiday with a toddler in tow, but with toys (and cbeebies!) on tap and champagne and fresh flowers on arrival, we were all catered for and came back feeling very refreshed. The markets and nearby towns were all lovely, as were the restaurants. We also made use of the babysitting service, which with an English registered childminder was very reassuring, and had a lovely rare romantic meal out together. 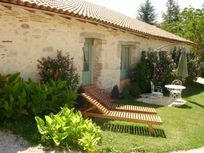 We are already planning our return and the only drawback is reluctantly raving about it to all our friends, when really we want to keep la maison de maitre our own secret! We've just returned from the most relaxing break at La Maison de Maitre. Everything was perfect. The cottage was beautiful and fully equipped with everything that we needed. The grounds of the property are lovely with the most wonderful view from the swimming pool. Juliet was great too and suggested lots of places for us to visit. A truly great experience. Thank you! 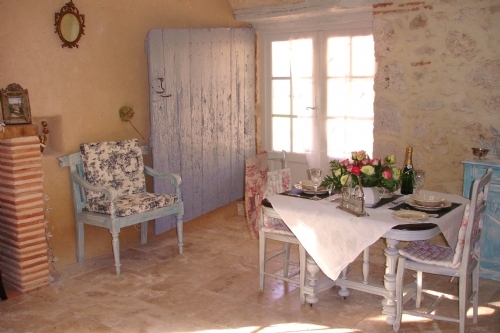 We had simply the best break in Juliet's stunning maison de maitre! We thought we wouldn't be able to have such a luxurious holiday with a toddler in tow, but with toys (and cbeebies!) on tap and champagne and fresh flowers on arrival, we were all catered for and came back feeling very refreshed. The markets and nearby towns were all lovely, as were the restaurants. We also made use of the babysitting service, which with an English registered childminder was very reassuring, and had a lovely rare romantic meal out together. We are already planning our return and the only drawback is reluctantly raving about it to all our friends, when really we want to keep la maison de maitre our own secret! Overall Rating: Outstanding! We've just returned from the most relaxing break at La Maison de Maitre. Everything was perfect. The cottage was beautiful and fully equipped with everything that we needed. 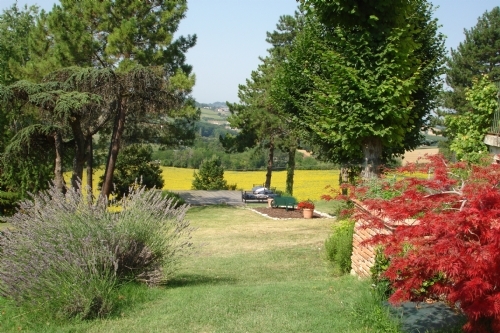 The grounds of the property are lovely with the most wonderful view from the swimming pool. Juliet was great too and suggested lots of places for us to visit. A truly great experience. Thank you! Overall Rating: Outstanding! La Maison de Maitre was great. I am recommending your website far and wide!"